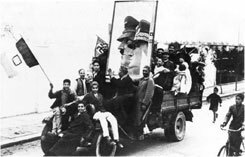 Supporters of Hitler and Mussolini in Libya in March 1943. When Pesach came, Alfonso Reginiano's mother brought out two hard-boiled eggs that she had saved for three months, ever since their arrival at Bergen-Belsen camp, and cut them into 21 pieces, one for each member of the family. Reginiano, who was born in Libya and survived the Nazi concentration camp, tells of the humiliation and hunger he experienced in the documentary film "Hashoah Halo Noda'at Shel Yehudei Tsfon Africa" (The Unknown Holocaust of North African Jewry), which will be broadcast this evening on Channel 1. Shalom Arbiv, also a native of Libya, who survived the Sidi Azaz camp, tells of his transfer to the camp, located 100 kilometers from Tripoli. "They shot people like flies," he testifies in the film, "and beat them mercilessly with sticks." The story of Libyan Jewry is also the subject of "Mitripoli Lebergen Belsen" (From Tripoli to Bergen-Belsen), which will also be broadcast this evening, on Yes. The film opens with a scene from the trial of Adolph Eichmann, but unlike many Holocaust films, these pictures are shown to tell the story of those whose testimonies were deemed superfluous to the trial of the German criminal. "When North African Jewry wanted to tell their story at the Eichmann trial," says Dr. Irit Abromski-Bligh of the Yad Vashem Holocaust Memorial Authority, "they were told, `You do not belong to this story.'" "From Tripoli to Bergen-Belsen," directed by Marco Carmel, is the first of two documentary films combined under the title, "Sh'eila Shel Zman" (A Matter of Time. 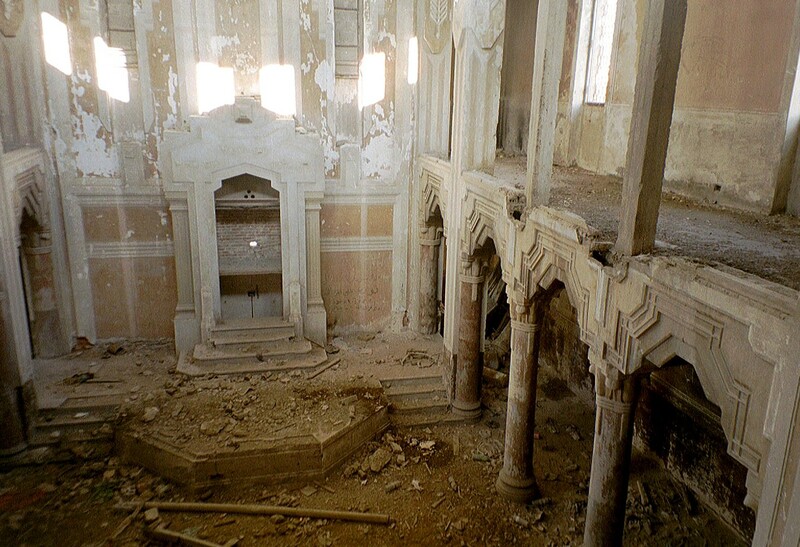 The two films, each about an hour long, deal with the fate of North African Jewry during WWII. The second film, "Goral Meshutaf" (Shared Fate), directed by Serj Ankari, follows the tribulations of the Jews of Morocco, Algeria and Tunisia. The two films raise many questions, the first of which is how is it that so many Israelis are unaware that the German reach extended to North Africa. 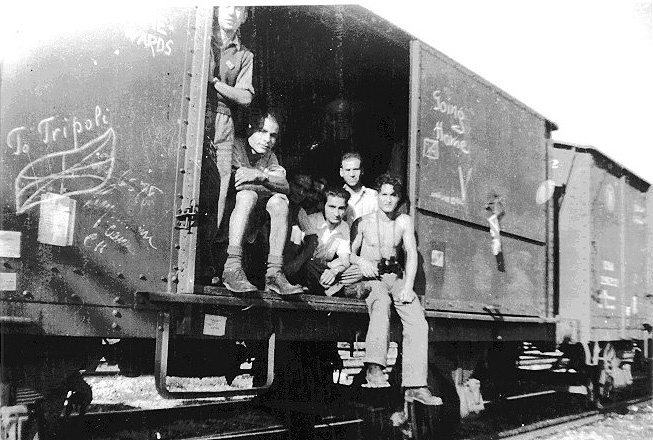 Holocaust survivors return to Libya from Concentration Camp Bergen-Belsen (note the inscription on the wagon :"Back to Tripoli"
This question makes the two films all the more important. The two directors faced a difficulty that does not confront the creators of documentary films on the Holocaust experiences of European Jews. While films about the European Holocaust - which are part of a known historical context - can focus on personal stories, testimonies and experiences, Ankari and Carmel had to create a documentary film largely devoted to history - to setting the general context - and could therefore focus less on personal testimonies. The title of the combined program, "Sh'eila Shel Zman," illustrates the point that had the Germans continued their conquests, North African Jewry would have suffered the same fate as European Jewry. Author and journalist Claude Sitbon says in the film, "What happened to us, compared to [what happened to] 6 million Jews, of whom a million were children; how do you dare compare those numbers to your hundreds of dead? As I see it, and this is what's most important, is the paramount need of Israeli society to say: The Nazi problem is a problem for the Jewish people. If this had been mentioned in the 1950s, we would not have become alienated in Israel. Perhaps Tunisian Jewry was saved, but we must not forget the Nazis' overall plan." 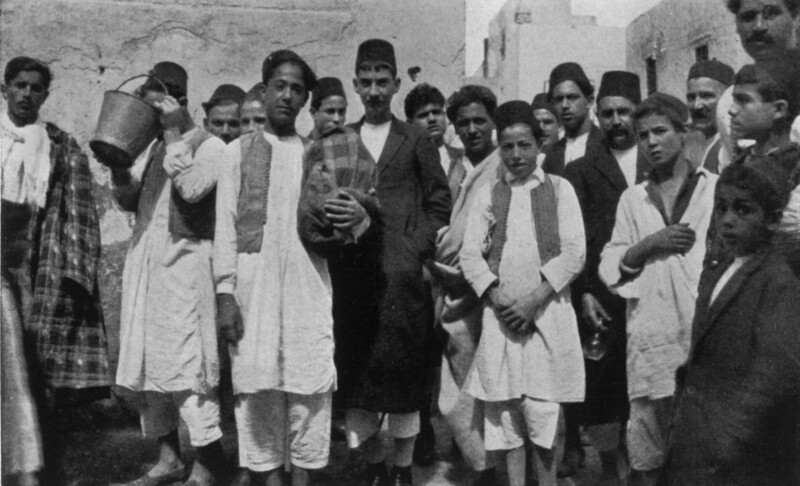 Carmel's film presents the experience of Libyan Jewry, most of whom were sent to the Jado camp in their home country. With the Italian invasion of Libya, the Jews' citizenship was revoked and they were subjected to new rules, involving the revocation of their basic rights. After the Allied victory in Libya, it appeared that the Jews had been saved - even though many of them were killed in bombings by the British - but then the Italian army returned and transferred the Jews to the Jado camp. Jado was not a death camp, says Abromski-Bligh, but many incarcerated there, mainly those with British citizenship, were sent to Bergen-Belsen. 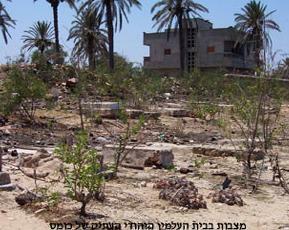 Many of the Jews who were left in Jado perished, mostly from typhoid, which ravaged the camp. The film explains that one of the reasons that not everyone was transferred to extermination camps in Europe was that the Nazis feared the Jews would bring diseases with them. "I focused on Libya," says Carmel, "because the Nazis really took over there, with many concentration camps and many being sent to Bergen-Belsen. Although these were different numbers, far smaller than the figures with which we are familiar from the European Holocaust, it was still a Holocaust. In the film, I do not quote numbers, or count the dead and injured, in order not to quantify the death. It was important to me to stress what happened there and provide a broader picture of the Holocaust of the Jewish people. I did not touch the memory of the European Holocaust at all; I only mention that we were there, too. In "Goral Meshutaf," (common fate) Ankari presents the experience of the Jews in northwest Africa - Morocco and Algeria, and mainly Tunisia. Moroccan Jewry was unaffected by the Holocaust, according to the film, but Algerian Jews lost their citizenship with the enactment of the Vichy laws in 1940. Some 120,000 Jews, who had until then considered themselves French, were affected. "On the day it was announced," testifies Algerian-born Ruth Shahar in the film, "I walked home from school and thought, `We're not French? I have only one option - suicide.'" Many Algerian Jews enlisted in the anti-Nazi underground. They viewed Free French President Charles de Gaulle as their leader, while the French Christians in Algeria identified with Marshal Petain. Most of the Arabs rejoiced at the arrival of the Germans. "Germany was portrayed as an anti-colonialist, anti-French, anti-British power," says historian Michel Abitbol. "That was enough for the Arab population to feel favorable toward Germany." A more bitter fate befell Tunisian Jewry. They were moved to about 10 labor camps and enslaved as forced laborers: They dug ditches for the German forces, built bridges and suffered terribly under the Nazi whip. The Jewish community was forced to provide infrastructure, food, heating and other comforts to the Germans and their prisoners. "Poor Jews were sent to the camps and forced labor, while rich Jews gave money and evaded that fate," says one witness. "Why didn't you flee?" the interviewer asks one witness, as survivors have been asked again and again over the years, even at the Eichmann trial. "We feared for our lives," answers the witness. The film explains that the distance from Europe, from the watchful eyes of Eichmann and Himmler, softened the Germans. One witness told of an Austrian soldier who gave him a coat when he mentioned the cold and the hunger. There is also the testimony of Yvette Sa'adon, who grew up in Tunisia and lived through the Holocaust as a young child. "It was an experience," she recalls, "We hid and they searched for us. When we fled, we saw animals and goats and chickens, which for us was an experience." The film also addresses claims that gas chambers were being built in Tunisian suburbs. "I didn't see any," says one witness, "but people told me that chambers were built to burn Jews." "There was no attempt to build extermination camps," says historian Haim Sa'adon of Tel Aviv University. "We found no documents to that effect." "Many have criticized me," says Ankari, "that I am expressing a position and stating there were no gas chambers in Tunisia. I am not saying that. I bring three witnesses who claim there were [chambers] and one historian who says otherwise. We even went to Tunisia to film, in the place where [the Germans] had ostensibly begun building the [gas] chambers." Ankari's interest in the story of North African Jewry during the Holocaust was aroused when an old Tunisian he met told him that there had been a concentration camp near his grandfather's house in Tunisia. 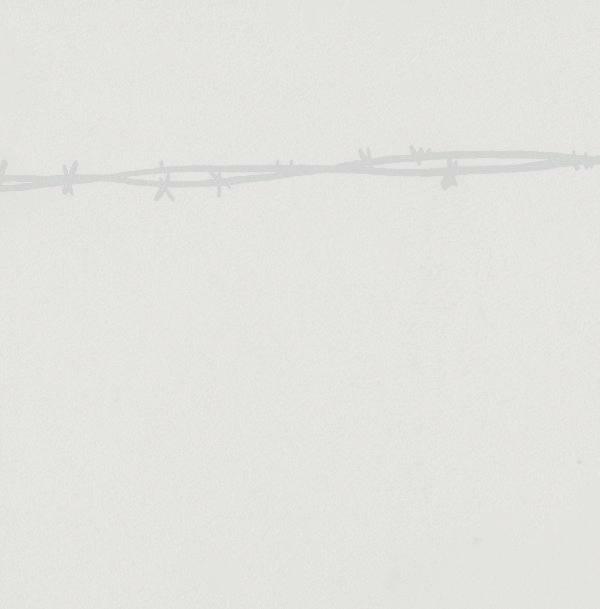 "Only then did I discover that there had been concentration camps there at all," says Ankari. "This is what makes the film so important. It is clear that the Holocaust in North Africa was not like the Holocaust in Europe; there is no comparison. But it is important for people to know that the Germans reached North Africa. Even someone who knows about Rommel and Montgomery doesn't know that the Gestapo was there, and does not know that there were concentration camps." The three films - the one on Channel 1, directed by Yifat Kedar, and the two being broadcast on "Yes" - provide a picture that blends historical facts, imparted by Carmel and Ankari, with the personal, painful stories presented by Kedar. In addition to the experiences of Reginiano and Arbiv, Kedar's film includes the testimony of Bruria Dadosh, a survivor of Jado. She speaks about her honeymoon in the camp, with her husband, and about their 2-month-old daughter who died. "She died right after an injection given to her by the camp doctor," recalls a teary-eyed Dadosh. "I think about her all the time." The most shocking testimony in the film is given by an unidentified, very blurry figure of a man, who relates how he was raped by a German. "He grabbed me by the throat," says the man, "It hurt. For me, I am no longer a man. I used to be clever. Not anymore. I am nothing. I hope no one recognizes me. No one has to know about this, until I die." "During the editing," says Kedar, "we trimmed his testimony because it contained harsh, sexually graphic descriptions. This was the first time he told his story, and at the end of his testimony he told the interview's director, Amnon Binyamin, `I hope that I never see you again in my whole life, because you know my most intimate story.'" None of the filmmakers accuses anyone of concealing the story of the plight of North African Jewry. "I could have made an entire film on why it took people decades to receive the monies due to them and why they were given nothing," says Carmel, "but I did not want to make a film about insult added to injury. It was important for me to make the first film that highlights this part of history. Later, more films can and should be made on this subject." Kedar says that many of the witnesses she interviewed were relating their stories for the first time. In "Sh'eila Shel Zman" a partial answer is offered as to why the witnesses have not spoken up until now. The effort to integrate into Israeli society was too great, explains the film. The discrimination and the melting pot policy were particularly harsh on the North African communities. Their new troubles essentially made them forget the old. Until the 1970s, no one considered what happened "there." The survivors also never discussed their experiences at home. "What will I teach them, to be sheep like us?" responded one witness when asked why he never told his family. "I have to give them the faith that they have the strength and the ability to change." "Why should I tell [them]?" asked another. "To make them feel bad? Let them live their young and beautiful lives." One of the daughters of the second generation, whose mother survived the Holocaust in Libya, says, "When I mention that my mother was in the Holocaust, no one believes me." Published with permission of the author Goel Pinto and the newspaper "Haaretz"
מחנה ג'אדו בו נכלאו למעלה מ-2600 יהודים ומתו בו כ-600 אסירים מתשישות, רעב ומגיפות. לוב Libya. מדינה בצפון אפריקה. ב-1943-1911 היתה בשלטון האיטלקים. יהודים ישבו בקיריני (Cyrne) שבקירינאיקה (Cyrenaica)מאז המאה השנייה לפני הספירה, ואולי אף לפני-כן. בשנים 116-117 מרדו היהודים ברומאים, השתלטו על שטחים גדולים אך דוכאו ונערך בהם טבח נורא. הידיעות הראשונות על יהודים בטריפולי הן מהמאה הרביעית. במאות השנים האחרונות היתה קהילת טריפולי הגדולה והחשובה בקהילות שבכול חלקי לוב, ושנייה לה היתה קהילת בנגאזי (Benghazi) בקירינאיקה, שהיתה חלק מיחידה מדינית-מנהלית נפרדת. הקיבוץ היהודי בלוב היה הקטן בקיבוצי ישראל בצפון אפריקה, אך שיעורו באוכלוסייה היה הגבוה ביותר: ב-1931 היה מספר היהודים בלוב כ-21,000 – 4% מכלל התושבים. ערב מלחמת-העולם השנייה היה מספרם כ-30,000. יותר ממחציתם ישבו בטריפולי, כ10% בבנגאזי, ויתרם בעשרות יישובים קטנים. בשלטון האיטלקים פעל בקרב יהודי לוב מוסד חינוך שיזמו יהודי איטליה. השפעת השלטון האיטלקי על יהודי לוב היתה קטנה מהשפעת השלטון הצרפתי על יהודי ארצות המגרב: שלטון האיטלקים היה קצר, יחסית, ורק ב-1931 השלימו למעשה את השתלטותם על לוב. התמונה צולמה בשנת 1925, יהודים (גברים) ביום השבת, ברובע היהודי של טריפולי. התמונה נתרמה לאתר זה ע"י בנעטיה פדהצור ממרכז "אור שלום" לשימור והנחלת מורשת יהדות לוב. האיטלקים גם לא גיבשו קו פעולה ברור ביחס ליהודים, והתלבטו בין שתי גישות סותרות: קו אחד דגל בקידום מדיני וחברתי של היהודים, וכנגדו פעלה מגמה שחששה שמא 'העדפה יתרה' של היהודים תעורר את זעם התושבים הערבים המוסלמים. ב-1935 נגזרה 'גזירת השבת', וסוחרים יהודים נאלצו לפתוח את חנויותיהם בשבת. ואולם, נראה שהגזירה לא היתה פרי מדיניותה של הממשלה ברומא, אלא יוזמה של ביורוקרטים איטלקים בלוב, שלא השלימו עם שיתוק כלכלתה של העיר טריפולי בשבת. בביקורו בלוב ב-1937 הסכים בניטו מוסוליני להיפגש עם נציגי הקהילה, והבטיח לרב הראשי, אלדו לטס, שהמשטר הפשיסטי יכבד את המסורות של היהודים. ואכן, באותה שנה בוטלו כול העונשים שהוטלו על הסוחרים היהודים בעטייה של 'גזירת השבת'. עם התקרבותה של איטליה לגרמניה הנאצית ב-1938 השתדלו השלטונות בלוב, ובראשם המושל איטאלו בלבו, שלא לתת ביטוי לקו האנטי-יהודי החדש של ממשלת איטליה. השלטונות נמנעו, מתוך רצון לשמור על הסדר הציבורי, מלהפיץ בלוב את דברי הנאצה נגד היהודים שהרבו להשמיע שידורי רדיו בארי האיטלקי ושנועדו לאוזני הערבים בארצות המגרב. ב-1938 נחקקו באיטליה 'חוקי הגזע' נגד היהודים, ואולם, בלוב הקהה איטאלו בלבו את עוקצם ונטרל את הארגונים הפשיסטיים המקומיים של ה'חולצות השחורות', שרצו מדיניות תקיפה יותר נגד היהודים., נראה שיהודי לוב סבלו מפגיעות הפשיסטים המקומיים פחות משסבלו מהתנכלויות התושבים המוסלמים, שגילו יחס עוין ליהודים על רקע המאורעות שהתחוללו אז בארץ-ישראל. היחידים שנפגעו אז מ'חוקי הגזע' היו דווקא יהודים אזרחי איטליה, שפוטרו ממשרותיהם בשירות הציבור. אומנם, הוחלט כי כול התלמידים היהודים יוצאו ממוסדות החינוך הציבוריים, ואולם, בלבו הקים למענם כיתות מקבילות באותם בתי-ספר יסודיים, ואפשר לקהילה לדאוג בעצמה להמשך לימודיהם של התלמידים שהוצאו מבתי-הספר התיכוניים. לא נשמר גם האיסור ב'חוקי הגזע' על ישיבת יהודים זרים בתחומי שלטונה של איטליה, ועד להצטרפותה של איטליה למלחמה ב-10 ביוני 1940 הוסיפו לשבת בלוב מאות יהודים אזרחי צרפת ונתיני בריטניה. אחרי הצטרפות איטליה למלחמה נתקבלו מרומא הוראות לכלוא את היהודים הללו במחנה ריכוז בג'אדו (Giado; Jadu), כ-150 ק"n מטריפולי, אך גם הדבר הזה נעשה באופן חלקי בלבד. תפנית לרעה במצב יהודי לוב חלה לאחר שב-28 ביוני 1940 נהרג המרשל בלבו בתאונת מטוס. ה'חולצות השחורות' האשימו את היהודים באגירת מזון ובריגול לטובת בריטניה. ב-9 בדצמבר 1940 פתחו הבריטים בהתקפה על האיטלקים בחזית מצרים, ובתוך חודשיים כבשו את קירינאיקה ובכלל זה את בירתה בנגאזי. המפלות מידי הבריטים החריפו את ההסתה נגד היהודים. היטלר שלח ללוב את 'קורפוס אפריקה' (Africa Korps) בפיקודו של הגנרל רומל, ובאפריל, מאי 1941 נהדפו הבריטים מקירינאיקה חזרה למצרים. האיטלקים שחזרו והשתלטו על קירינאיקה האשימו את היהודים בשיתוף-פעולה עם הבריטים, אסרו וענשו קשה כמה מהם, אזרחי צרפת הועברו לתוניסיה ונתיני בריטניה, כ-300 נפש, הועברו לאיטליה, ונכלאו במחנות הסגר. בין המחנות הללו צ'יוויטלה דל טרונטו (Civitella del Tronto)שבמרכז איטליה, מצפון לטרמו, בניו אה ריפולי (Bagno a Ripoli)שליד פירנצה, ובסנו דל גרפה (Bassano del Grappa) כ-30 ק"מ לויצ'נצה. ב-1944, אחרי כיבוש צפון איטליה בידי הגרמנים, הועברו הנתינים הבריטים הללו למחנה ריכוז ברגן בלזן. בדצמבר 1941 – ינואר 1942 כבשו הבריטים שנית את קירינאיקה, אך במאי-יוני שוב נהדפו משם, והגזירות על יהודי לוב הוחמרו עוד יותר. מוסוליני ציווה 'לפזר' את יהודי קירינאיקה ולכולאם במחנות בלוב. בחודשי יוני-דצמבר 1942 הוצאו צווים אנטי-יהודיים רבים, והם פגעו בכול יהודי לוב. הצו הראשון הטיל פיקוח חמור על פעילות היהודים בתעשייה ובמסחר, וכן אסר עליהם לקנות, למכור או לחכור נכסי דלא ניידי או מפעלי חקלאות הן מאיטלקים 'ארים' והן ממוסלמים. נאסר עליהם גם לעסוק בייבוא ובייצוא של סחורות מאיטליה ואליה, לעסוק בסחר סיטונאי ובכול פעילות הקשורה בהגנה צבאית על לוב. כעבור כמה שבועות חויבו כול הגברים היהודים בני 45-18 בעבודת כפייה, ולשם כך נערך מפקד כללי של היהודים. באוגוסט 1942 הוקם מחנה עבודה בסידי אל-עזיז ((Sidi Azaz. ב-9 באוקטובר פורסם צו המחיל על יהודי לוב את 'חוקי הגזע' שהיו בתוקף באיטליה, והטיל עליהם עוד הגבלות, ביניהן איסור להיות בעלים או מנהלים של בנקים, חברות ביטוח וחברות תובלה, להיות חברים באגודות שיתופיות ולפרסם כול דבר דפוס שאינו בעל אופי דתי. החוק נכנס לתוקף ב-17 בדצמבר 1942, אך לא הופעל, כי המערכה בלוב כבר היתה בשלביה הסופיים, כול קירינאיקה שוחררה, הבריטים המשיכו להתקדם לעבר טריפוליטניה, וב-23 בינואר שיחררו את טריפולי. בכך בא הקץ לשלטון האיטלקים בלוב והתחיקה הגזענית בוטלה. עם החיילים הבריטים הגיעו גם יחידות עבריות מארץ-ישראל, ובאישור השלטונות הבריטיים החלו לארגן סיוע לחוזרים מהמחנות ולשקם את מוסדות הקהילה. בסתיו 1944 יצאו רוב החיילים העברים מלוב, והסתמנה הרעה ביחסי המוסלמים ליהודים. לאומנים שחזרו ללוב עם סילוק האיטלקים והגרמנים שילהבו את ההמונים בהסתה אנטי-ציונית ואנטי-בריטית. 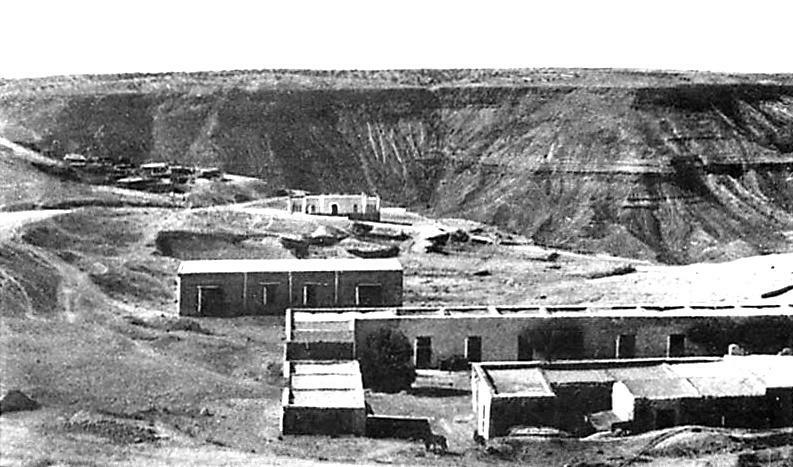 ב-7-5 בנובמבר 1945 התחוללו פרעות ביהודי לוב, מהחמורות בתולדותיה: 121 יהודים נרצחו, רבים נפצעו, בתי-כנסת נהרסו, ומאות בתי מגורים ובתי עסק נשדדו ונהרסו. רק ביום השלישי התערב הצבא הבריטי ודיכא את המהומות. הפרעות גרמו זעזוע עמוק בקרב היהודים, שינו מיסודם את יחסיהם עם הערבים, הגבירו את תודעתם הלאומית, חרצו את גורל הקהילה היהודית והגבירו את הרצון לצאת מלוב ולעלות לארץ ישראל. ב-1948 שוב התחוללו פרעות, אך אז התגוננו היהודים והרגו כמה מהפורעים. ב-1951-1950 עלו יותר מ-30,000 מיהודי לוב לישראל. בעקבות מלחמת ששת הימים שוב התחוללו פרעות, רבים יצאו מלוב - חלק גדול מהם לאיטליה - ובלוב נשארו יהודים מעטים בלבד. ב. מחנות מעצר וכפייה שהוקמו ליהודים בלבד, ושפעלו ממאי 1942 ועד כיבוש לוב בידי הבריטים. מחנות ההסגר העיקריים לנתיני אויב שהוקמו בלוב עצמה היו בתאג'ורה Tajura)), במבצר סידי עבד אל כרים (Sidi abd el Krim כ-18 ק"מ ממזרח לטריפולי; בוארת אל חסון Buerat al-Hsun)), כ87- ק"מ ממערב לסרת (Sirte)שבטריפוליטניה, ובהון (Hun), כ-227 ק"מ מדרום לסרת. מחנות מעצר קטנים הוקמו בפרברי בנגאזי ובפרברי טריפולי. ב-1942 הוקמו מחנות הכפייה ליהודים בלבד. המצב בחזית הצריך בדחיפות כוח אדם עובד לעזרת המיפקדות הצבאיות. מחנות הכפייה העיקריים שהוקמו בלוב ב-1942 היו סידי אל-עזיז ובקבק (Bukbuk) ליהודי טריפוליטניה, ומחנה ג'אדו ליהודי קירינאיקה. חלק קטן מיהודי קירינאיקה נשלח גם לעיירות הסמוכות לג'אדו ושוכן בבתים שלא במסגרת מחנה, בגאריאן (Gharyan) ביפרן (Jefren) ובתיגרינה ((Tigrinna. מחנה ג'אדו היה המחנה הגרוע ביותר בלוב. מתוך 2,600 יהודים שהובאו לג'אדו מתו יותר מ-500 מתשישות ומרעב, ובם- יוחד ממגיפות טיפוס הבטן וטיפוס הבהרות. המחסור במים, התזונה הלקויה, הצפיפות, והלכלוך הגבירו את ההידבקות. ג'אדו היה מחנה צבאי לשעבר, מוקף גדר תיל. מפקדיו היו איטלקים, והשומרים היו שוטרים איטלקים וערבים. על גבעה שצפתה על המחנה הוצבה מכונת ירייה לירות במנסים לברוח. אחד הביתנים במחנה היה צינוק למפרים פקודה או לעוברים עבירה קלה אחרת. העוברים עבירות חמורות יותר הועברו לבית-הסוהר בטריפולי. היהודים שוכנו בעשרה ביתנים ארוכים בלי מחיצות פנימיות. בכול ביתן שוכנו כ-370-300 נפש בתנאי צפיפות רבה. המסגרת המשפחתית נשמרה, אך כדי לזכות בפרטיות מסוימת הקימו המשפחות מחיצות ביניהן משמיכות ומסדינים. תנאי התברואה היו ירודים ביותר. תחילה ניזונו היהודים ממזון שהביאו עמם, אחר-כך נאלצו להסתפק במזון הדל שסופק במחנה: כ-150-100 גרם לחם ליום ועוד הספקה שבועית קטנה של אורז, מקרוני, שמן, סוכר, תה וקפה. מי שהשיגה ידו השלים את החסר במזון שקנה מרוכלים ערבים שהותר להם להתקרב לגדר. עזרה מסוימת הגיעה מטריפולי. העבודה שהיתה מוטלת על העצורים היתה פינוי זבל, רחיצת השירותים והעברת חצץ וסלעים ממקום למקום. בדרך-כלל לא היתה מכסת עבודה יומית. לכול ביתן היה אחראי (capo), שתפקידן היה לדאוג לסידור העבודה. האחראים אף דאגו לסידור בית-כנסת באחד הביתנים וקבורת המתים הרבים בבית-קברות על גבעה שמחוץ למחנה. במחנה סידי אל-עזיז היו כ-1,000 גברים יהודים בני 45-18 מטריפולי וסביבתה. רובם פועלים מקצועיים, שגויסו לעבודת כפייה, בעיקר לבניית מסילות ברזל ולשיפוץ דרכים. המפקדים היו איטלקים, אך מדי שבוע ביקרו קצינים גרמנים במדים לעריכת ביקורת. כמעט שלא היו במחנה מבני קבע פרט לשניים-שלושה צריפים, שבהם שוכנו האחראים היהודים. שאר הכלואים היהודים שוכנו באוהלים בלבד. בכול אוהל ארבעה- חמישה אנשים. תחילה לא היה המחנה מגודר אלא שכן בשטח מדברי פתוח ליד העיירה ח'מס ((Homs. כעבור כמה חודשים גודר המחנה בגדר תיל. כול הכלואים חולקו לקבוצות קטנות של 60-50 איש, ובראש כול קבוצה עמד אחראי יהודי, והוא פיקח על מילוי המכסה היומית. כול בוקר נערך מפקד נוכחות קפדני ואחריו יצאו כולם לעבודה מחוץ למחנה בעקירת אבנים ובהעברת חצץ. שעות העבודה היו 06:00 עד 16:00. המזון היומי היה מורכב מפחות מחצי ק"ג לחם, ואורז או מקרוני בצהריים. מדי פעם הובאו גם קופסאות שימורים. העשירים יותר השלימו את מכסת המזון מן הרוכלים הערבים בסביבה. כ-350 איש הועברו ממחנה סידי אל-עזיז למחנה בקבק שמעבר לגבול המזרחי של לוב כדי להכשיר כבישים. בראש המחנה עמד מהנדס יהודי, משה חדאד, והוא שגייס את האנשים בסידי אל-עזיז ואחר- כך פיקח על העבודה במחנה. הוא גם ציווה על אנשיו לחפור שוחות כדי להתגונן מפני התקפות המטוסים התכופות של הבריטים. היהודים יצאו לעבודה ב-07:00 וחזרו בשעות הערב. הם עקרו סלעים, עדרו אבנים וסיתתון כדי לסלול מחדש את הכבישים לאורך גבול מצרים. ואולם, הפיקוח היה רופף למדי. המפקד המחוזי האיטלקי בא לביקורת רק כעבור כמה שבועות. בהעדר פיקוח ניסו היהודים לחבל בכוחות ה'ציר' על-ידי סגירת חלק מהכביש לצורך שיפוץ. לפיכך נאלצו כלי-הרכב הנסוגים ממצרים לרדת לשולי הכביש ולשקוע בבוץ. היחסים עם הפיקוד האיטלקי הין מתוחים אך יהודים לא נפגעו מכך. בדרך-כלל הספיק המזון. הקושי היה מחסור במים, וכן הניתוק המוחלט מכול יישוב. המחנה לא היה מגודר אך לא היה לאן לברוח. היו שהתחלו ויצאו את המחנה באישור הרופא האיטלקי במחנה, ובהדרגה ירד מספר העובדים לכ-200. היהודים נשארו בבקבק כחודשיים בלבד, כי ב-6 בנובמבר 1942, עם נסיגת האיטלקים והגרמנים, קיבלו הוראה לחזור בכוחות עצמם לטריפולי.